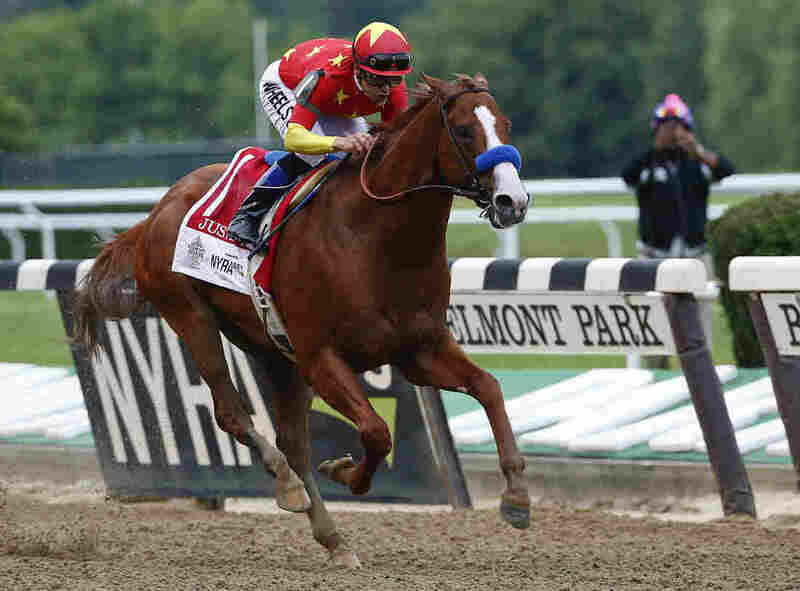 Justify Captures Triple Crown With Belmont Stakes Win Justify is the 13th horse to capture the title, delivering legendary horse trainer Bob Baffert his second Triple Crown win. Justify, with jockey Mike Smith aboard, crosses the finish line to win the 150th running of the Belmont Stakes horse race, and the rare Triple Crown title on Saturday in Elmont, N.Y. Justify won the 150th Belmont Stakes, making him the 13th Triple Crown winner. The big, chestnut colt stood above the other horses with a commanding lead all the way through the homestretch Saturday in Elmont, N.Y. It was only his sixth race, and some bettors had worried that he packed too many races into the 110 days leading up to the race, but it was no contest. Justify, jockeyed by Mike Smith, became a sensation because of his impressive size, his calm and dominating presence, and his ability to overcome inexperience. "The whole time he was so professional," Smith said of Justify after the race. "He was standing so good, almost too good. I was a bit worried, but my gateman reassured me. He said, 'He's standing good. He'll break.' "
This is the second Triple Crown win for legendary horse trainer Bob Baffert. In 2015, Baffert won with American Pharoah, the last horse to capture the title. Baffert, 65, had less than a year to train Justify who suffered a minor injury and didn't race his second year. The Belmont Stakes is the last of the Triple Crown races, after the Kentucky Derby and the Preakness Stakes. All of them are long races for a horse, from just under 1 1/4 miles to 1 1/2 miles. And they come in short order. So any horse that wins all three passes a threshold of speed, strength, and just plain grit. Before the race, bettors gave Justify a 3-5 chance of winning, a clear favorite. The next closest was Hofburg at 6-1 and Bravazo at 8-1. More than $10 million was bet on the race. Prior to loading into the starting gates, Justify pranced eagerly before the cheering crowd, ears pricked and his shoulder coat sweaty. Deep in the homestretch, the grandstands rumbled. When Justify crossed the finish line spectators were seen weeping. "I think everybody wants to see this happen because he's a beautiful horse," Baffert said. "He's just so tough. He's just an imposing horse." Long shot Gronkowski nipped at Justify's heels but could never catch up. Hofburg finished third. Justify's breeding rights have been reportedly sold for $85 million. Justify's owners neither confirmed nor denied those reports.